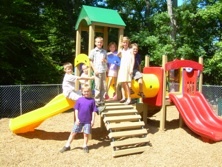 St. Andrew Preschool is a developmentally appropriate program that emphasizes both educational and Christian values via a “learn through enriched play” philosophy. It is a place where children are free to learn by exploring, wondering, touching, playing, doing and discussing the things that interest them. Nurturing, supportive teachers share their amazement and joy while encouraging their sense of accomplishment as they discover the world around them. At St. Andrew Preschool, teachers use thematic units to plan developmentally appropriate learning experiences that will enrich their students’ growth in the crucial domains of social, emotional, physical, spiritual and cognitive early childhood development. Our teachers foster children’s independence and confidence to help them gain skills in the areas of problem-solving, decision-making, language, math and literacy to help children develop a motivation for learning that will prepare them for a successful transition to kindergarten and throughout life. We currently are a religiously exempt from licensure and strive to improve in providing a quality preschool to our community. We would love to have your child join us. Please call (757) 714-2211 or email standrewdirector@gmail.com if you have any questions about registering.